Originally self-published as a very limited triple 3″ CDR release in May, 2009, Celer’s Levitation And Breaking Points is now available again on CD – this time limited to 300 copies. Surely one of Celer’s most subtly beautiful and uplifting albums out of an already beautiful, highly prolific and much celebrated discography of work. Especially magical to listen to in the early evening as the sunlight fades below the horizon… a balm for the soul. Photography and cover design by Dale Lloyd. Originally released as three, single-track mini CDRs in a hand-painted carton box, these long-form pieces show off Celer at its prime, masters of a uniquely affecting ambient music that garnered the duo a standing among critics and listeners it never relinquished. The rhythm of the ”all-inclusive” is still there but it now pulses gently under the thin skin of the temples. The drone is accordant but leavened with a nigh on undetectable atonal yeast. Levitation is indeed achieved though the only breaking points occur between tracks and even then are barely noticeable. Rather, the album is as smooth and flawless as a fresh sheet of ice. It possesses a seraphic decorum that makes you feel virtuous just by listening. This is a proper CD release of a triple 3″ CDr that Celer self-released in 2009. The three tracks are all just over 20 minutes long, and all flow similarly. 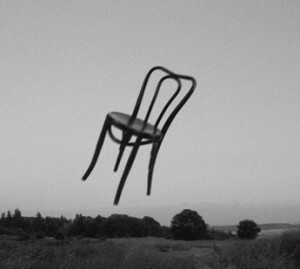 The cover photo shows a chair suspended in mid-air, and the music itself is just as free-floating and relaxed. There’s a constant slow delay, and the album feels like staring out and being able to see a consistent blinking light in the distance, but not being able to figure out what it is or where it’s coming from. Fittingly, the text inside the tray simply reads “Dedicated to the anonymous and the unknown.” Of the three tracks, the second, “The Enlightened Scapegrace”, seems to have slightly more going on; there’s a bit of a windy bass drone, it seems slightly louder and deeper, and it even feels like a bit of a climax during the last few minutes. But only relatively. It takes just a few words to explicit our impressions in front of Levitation And Breaking Points, re-released by Dale Lloyd’s And/OAR two years after the original triple 3-inch edition. Describing the mere exteroception – as always in corresponding circumstances – is an intention that ultimately results in the typical fatuousness attached to any similar attempt when one listens to uncrystallized masses of sound rich in shifts of imaginary harmonies and ethereal chromaticity. Perhaps we could do better referring to “presence” and “absence”, for these two opposites lie – here more than anywhere else in Celer’s recorded output – at the basis of the pervading sense of noetic improvement and corporeal liquefaction perceived during the protraction of the experience (needless to say, this disc is a natural nominee for the “infinite repeat” mode). The richness of psychological phenomenologies remains the most valid point of discussion for this type of outing; both Will and Dani Long worked in the ambit of music therapy, so they were probably able to predict certain effects on a listener’s involuntary cognition since the beginning. What the miserable reviewer must do in such a circumstance is, once again, stressing the need of separating who operates in this area with a background of genuine education and sentience from those who join the bandwagon without having a clue about the grandness of these issues. Celer were in search of truths while in exploration, and this record shows their absolute commitment to orbiting towards spheres that – hypothetically – any individual gifted with serious inner means and a modicum of volition can reach. Especially by remaining silent. Ooh I like a bit of Celer in the evening. Daytime it doesn’t work for me but come the evening I’m all ready to be pulverized into a fluffy Phil of calmness and tranquility. Always a pleasure, never a chore. This was originally released in 2009 as a triple 3” CD set and is now well rocking horse. So and/OAR have done a slightly more fan-base friendly edition of 300 in a digipack with a flying chair on. Celer are really rather good at creating warm sounding drone music and this three track album (each track twenty minutes plus) cements this. There’s no mass variation from their palette here but you’re probably not expecting that. You get three very long tracks which ebb and flow, throb and pulse with the gentlest of variations and somewhat rarely for drone music they have that bit of feeling about them which makes ’em all warm sounding. You know what you’re getting with Celer and if you’re after the drone badge of quality then this gets it. The duo self-published Levitation and Breaking Points as a limited triple-three-inch CD-R release in early 2009, which has now been given a new lease on life in a 300-copy single-CD edition through the good graces of and/OAR. This one’s comprised of three long-form, twenty-minute meditations, their titles again reflective of Danielle’s poetic style, with all of them unspooling at a becalmed pitch that grows especially hypnotic when heard near day’s end with the lights low if not off altogether. Silken wisps of organ-like tones softly pulse through “Floating Parasomnia,” “The Enlightened Scapegrace,” and “Obtuse Sensibility,” carefully modulated by Celer so as to never become too intrusive and thus in keeping with Eno’s infamous ambient dictum that “Ambient Music must be able to accomodate many levels of listening attention without enforcing one in particular; it must be as ignorable as it is interesting” (from the 1978 liner notes to Music for Airports). Материал «Levitation And Breaking Points», посвященный всему неназванному и непознанному, впервые был издан в 2009 году в виде приватного релиза силами самих музыкантов «Celer», и представлял собой три мини CD-r`a (по одному треку на каждом), упакованных в специальный конверт с ручным оформлением. Лейбл «and/OAR» спустя несколько лет упростил эту идею и сделал ее более доступной, издав все треки на одном диске приличным по нынешним временам тиражом. Слушая эту музыку, понимаешь, что так даже логичнее и правильнее – не нужно выплывать из этого странного дурманящего тепла, из кокона монотонных, тихих звуков, приятно резонирующих где-то внутри тела, не нужно пробуждаться каждый раз, когда нужно поменять диски в проигрывателе. Закономерно, что в этих трех продолжительных вещах заключено все то, что было характерно для творчества американского дуэта конца нулевых. Нет, не заключено, наоборот, выпущено на волю. Свободно парящие вокруг звуки, долгие, вытянутые, доведенные до того выхолощенного состояния, которое уже не позволяет опознать, чем же они были первоначально – несколькими нотами, сыгранными на скрипке или отзвуком пары нажатых клавиш органа, образуют бесконечные, то затухающие в полной тишине, то вновь вспыхивающие тусклыми огнями звуковые потоки. Их звучание, а, точнее, тот эффект, который замечаешь через пару минут, когда эта музыка проникает в мозг, разгоняя все мысли и начинает аккуратно перестраивать заряды миллиардов нейронов, заставляет вспомнить о том, что участники «Celer» когда-то активно интересовались звуковой терапией, возможностью исцеления с помощью подобных, заточенных под данный результат, композиций. Для достижения наилучшего результата вам нужно обеспечить полную тишину и покой, дождаться сумерек и следить за тем, как по стенам медленно сползают в тень последние солнечные лучи, следуя за неспешным и аккуратным движением образующих «Levitation And Breaking Points» звуков. Время и физические процессы замедляются, границы реальности немного сдвигаются в сторону сна и кажется, что в этом состоянии возможно все: левитация, преодоление преград, познание непознанного и многое другое.